I'm not calling it the "best" photo, just my favorite. Why? Well, because they're so adorable, of course! These sheep live at Gretchen and Randy's place, just a mile or so down the road from me. We went to visit them one muddy spring day, just after the lambs were born -- the little human kids and the little sheep babies frolicked together. I originally called this photo "The girls...or can't we all just get along?" The girls seem to go everywhere together, in a little pack, just like all girls everywhere! And they are so beautifully multicultural, aren't they? And of course it's Theme Day around the world: I will update this list in the morning as I'm sure others will join in at the last minute (as I did), but for now, this is the list of who is sharing their best, or favorite, photos of the year. I'm posting early (and keeping it up late) so that European and Asian tourists can see my picture at their leisure, but remember that depending on time zones (and on people's relative states of grogginess on New Year's Day) photos will go up at various times throughout a 24+ hour period. That's a wonderful choice Jenny! I love the other pics too. What a hoot! I have totally enjoyed your blog this year, and I look forward to keeping up with Sharon next year. All the best in 2008 for you and your loved ones: Joy, Love, Prosperity. I love the pics. It looks like the girls all have a different hair style. I had such trouble deciding which photo to post as my favorite for 2007. Love the photo! I can see the grin on their faces! haha.. This photo gives a fuzzy wuzzy wooly feeling too. Lovely photo! Wishing you a very Happy New Year from Singapore! A great photo, to be sure! Happy 2008. 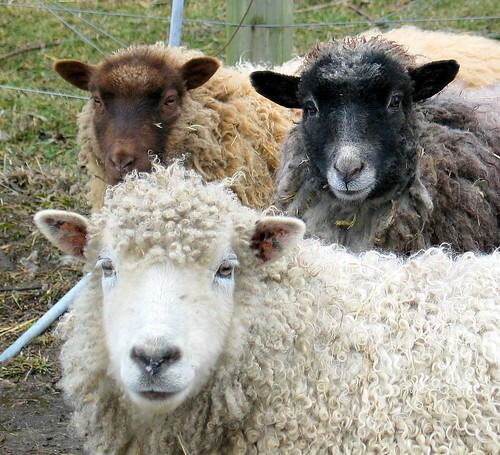 Love those faces and would love to sooth my dry hands in their warm woolly coats. Great choice for any year. Happy 2008! Agreed...super adorable! Good photo 2! Happy New Year from Wailea, Maui. I love this one too. I like how you got all the colors covered. I couldn't decide and am leaving it up to the votes. I narrowed my down to seven. Yikes! Hate to say I just couldn't pick one. Come take a look and put your vote in. I like the picture too. It's difficult to choose a best picture of the year. I too just chose one of my favorites. Best wishes & Happy New Year! Well, as long as you're happy, we're happy! I'm resisting inserting a verse of Baa Baa Black Sheep. I see on the portal where you're going to have a show! That's fantastic and I do hope you'll keep us informed. Talk about poker faces! Cute one! Best wishes for 2008! Three faces of special qualities. I do like your photography selection today. Thanks for your visits to my blog in 2007 and I hope and pray you have excellent health and are very happy all the days of your life but especially in this new year 2008. Happy New Year from Patty and me. Great choice. Thanks for another year of beautiful photos. I haven't been commenting as frequently lately but I visit almost every day. I linked to your blog for the first time this morning, through Ruth's. I love "the girls." They start my 2008 with a smile. Best wishes for them and to you. j'aime beaucoup, ils sont très curieux du photographe. mes meilleurs voeux en cette année 2008. I like very much, they are very curious photographer. My best wishes in the year 2008. Love your photos. Hope you have a great "New Year". From West Sacramento Photo of the Day. They are very cute....great photo! Happy New Year, and come back as soon as you can! These animals have so much appeal to people of all ages. Good choice and I enjoyed the extra photos. It is my hope that 2008 will be a wonderful year for you, your family and friends. Here's to good health, happiness, and many joyous occasions. I love this one, excellent choice (mind you, you could have picked many other ones from your excellent work...). Bonne année de Paris et thank you for taking part in the City Daily Photo community. I look forward to news about your exhibition. Oh, go ahead and call it the best. The composition, the color, the sweet beasties. . .It works for me! I've long admired your talent and am so excited for your show. Congratulations, and continued success in this coming year. Best wishes to you and your lovely fam in that lovely place we've all come to love through your photos. Makes me smile, they are too adorable! Excellent choice, happy new year! Baa Baa! Great photo and Happy New Year! this is such a sweet photo. The best to you in 2008! Are you still running? Love the shot! Hope you have a great New Year! Ha! That's great! I love them! Happy New Year from the frozen winter wonderland of Minneapolis! wow you really know how to frame a shot. I really like this image. Have a most wonderful 2008, full of joy and great photography! Good choice, have a great New Year. Happy New Year from Germany, Jenny! I love your choice, as usual!! You are still my favorite dailyphoto blog and I can't wait until it's February!! Nice choice, je l'adore (you were absolutely right, Jenny!). Happy New Year from Arradon, Bonne et heureuse année! We'll miss you in January. Looking forward to your show. Happy new year and long life to your blog. personal favorite was how I chose my photo too, Awesome choice! Happy New Years to you and yours in 2008! Fantastic shot. It's like they were really posing for you. I look forward to visiting your blog more often this 2008. And you're welcome to mine, too! For some reason, my link was not included in the participating blogs for the 1st of January 2008 theme day. Sorry I wasn't able to visit your blog sooner. I was in transit the whole of yesterday. I am now back in Norwich after the most fantabulous time at home in Manila. Happy New Year to you and everyone you hold dear! Jenny, thanks for stopping by New ORleans Daily Photo for theme day. I have bee so snowed under with work and holidays, I have haven't had much time for all my CDP visits. I remember your theme day picture from the first posting. Something about it makes it stand out in my mind. grrrrr I keep forgetting theme day! But I'm glad you remembered: this is just wonderful. It makes me smile. Well, I am back and the same sheep are at the gate. Did you get stuck in a snow drift? I hope you are OK.
jenny, i've only just discovered the daily photo blogs and only saw yours yesterday - i'm addicted to it ! what gorgeous pictures and lovely write-ups, i hope you never stopping blogging. your community sounds so wonderful. wonderful wonderful blog ! well done !!! Hi Jenny, I hope you come back soon b/c I miss you and enjoy your blog so much! You deserve the You Make My Day Award. I linked to you from my Seguin (TX) blog and just wanted you to know. Hope you are well. I am delighted to pass you the “You Make My Day” Award for your inspiring photo blog and dedication to the Daily Photo community! Please visit Auckland Daily Photo blog to receive the Award and pass it on! Hi Jenny, i've only recently discovered the daily photo blogs so i've only just joined, but just to say ......... hope you come back soon, your daily photos are one of my favourites and i miss them loads ... hope everything is alright though, take care of you !